Healthy and disability free life expectancy are alternative measures of health which consider how long an individual can expect to live in reasonably good health or free of disability. 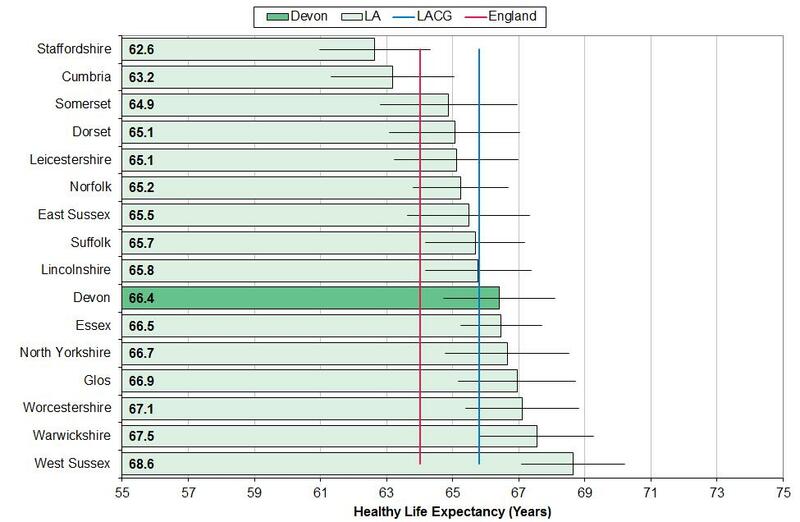 Table 10.2 shows healthy life expectancy (HLE) and disability free life expectancy (DFLE) for the areas with the shortest and longest health expectancies in Devon, as well as Devon as a whole, the South West and England. A percentage figure is also included to show the average proportion of life spent in good health or disability free. This reveals a 17 year gap between Central and East Ilfracombe and the Exe Estuary for male healthy life expectancy and a 14 year gap for male disability free life expectancy, with people in more deprived areas likely to spend a lower proportion of their life in good health or disability free. Healthy and disability free life expectancy in Devon is above the England average, although females typically spend a lower proportion of their life in good health or disability free. Males in Devon can expect to live for 65.6 years in good health, compared with 63.4 years in England, 65.1 years in the South West, and 65.3 years in the local authority comparator group. 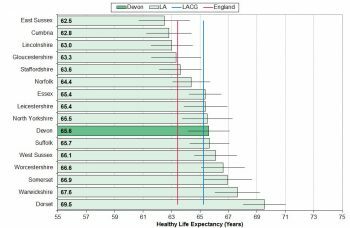 Healthy Life expectancy for males ranged from 55.0 (Blackpool) to 70.5 (Wokingham) nationally, ranged from 59.0 (Plymouth) to 69.5 (Dorset) within the South West, and from 62.5 (East Sussex) to 69.5 (Dorset) within the local authority comparator group. The range of male healthy life expectancy in Devon’s local authority comparator group is shown in figure 10.3. Females in Devon can expect to live for 66.4 years in good health, compared with 64.0 years in England, 65.6 years in the South West, and 65.8 years in the local authority comparator group. Healthy life expectancy for females ranged from 54.4 (Manchester) to 72.2 (Richmond upon Thames) nationally, ranged from 59.5 (Plymouth) to 68.2 (South Glos) within the South West, and from 62.6 (Staffordshire) to 68.6 (West Sussex) within the local authority comparator group. The range of female healthy life expectancy in Devon’s local authority comparator group is displayed in figure 10.4. Males in Devon spend 0.8 years less in good health than females, which is much smaller than the gap in life expectancy (3.7 years). 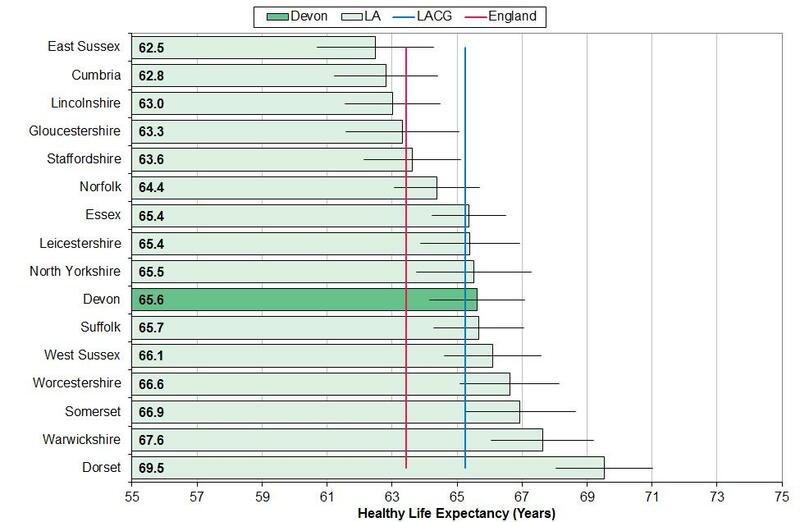 Nationally, more deprived areas have lower healthy life expectancy. 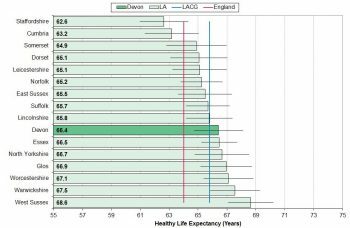 Figure 10.5 shows average healthy life expectancy at a middle layer super output area (MSOA) level across Devon. The highlights below average healthy life expectancy in Ilfracombe, Barnstaple, Bideford, Tiverton, Honiton, Exmouth, Dawlish, Newton Abbot, Ashburton, Buckfastleigh, Exeter City Centre, Wonford, Whipton, and some rural areas especially in North and West Devon.